"Thanks to your help new forces are being created to give our country a better future." Click here to e-mail us about starting a sponsorship today. Ana Callisaya: "I was all ready to begin my university studies, but then my father lost his job and told me that he could no longer afford to pay my fees. I was devastated, because I counted on being able to improve myself and help my family. Then Hermano Bernabé told us of the possibility of a scholarship. I could hardly believe it. It seemed like a miracle." Anna has graduated, is practicing dentistry in a municipal medical center, and took the lead in initiating a Healthy Students program for Quaker schools. Esther Tinco Mamani, an agricultural engineering graduate, tells of the class project in which they participated in a survey of rural farming practices, learning that more than 80% use toxic chemicals with resulting significant illness and birth defects. They worked with a UN Food and Agriculture Organization project teaching organic methods and helping the urban poor in El Alto establish micro-gardens in their homes. Her team took top honors in the class for their work. View Esther's video interview, where she talks about pursuing her degree in agronomical engineering - a profession she was told she should avoid because it was a "man's job". 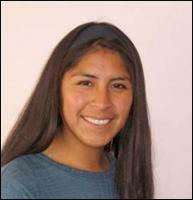 Valeria Carita Lupa, a social work student, engaged in a practicum working with youth in El Alto. She helped develop a curriculum dealing with self-esteem, gender equity, and domestic violence. 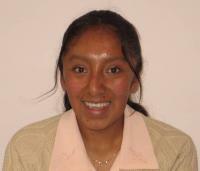 Valeria also volunteered in a literacy program while studying. Ruben Ruiz: "With the scholarship I am able to study more and my grades have improved. Before, I was working at a fast-food shop, from seven in the evening until two or three in the morning, six days a week. Now with the scholarship of $50 each month, I have stopped this work. I stay awake better during classes and can study without falling asleep. The scholarship has made all the difference for me." Learn more about our scholarship recipients by visiting our album of scholarship students' photos and stories. 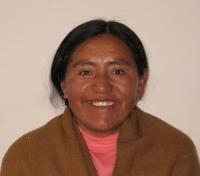 The scholarships are awarded by a committee of Bolivian Quakers, who make award decisions by the end of January. Recipients must be Bolivian Quakers and approximately half the recipients must be women. All of the scholarship students belong to indigenous ethnic groups. Students must also demonstrate a commitment to using their education to serve others for the betterment of their communities and their country. Many are already making a real difference! Stipends are paid February through November, following the Bolivian school year. Monthly scholarship payments are made to the students during meetings with the scholarship committee in the BQEF office in La Paz, where students must come to receive their grant money. The committee thus has the opportunity to discuss each student’s work and to give guidance and encouragement. In addition, recipients are expected to submit a written report every few months. Thanks to donors like you, BQEF supported 15 scholarships in 2003, growing to 45 in 2017. Bernabé Yujra reports: "The scholarship recipients have improved greatly in their ... study at the universities, ...they are very happy and grateful for the scholarships...This encourages us to continue working, so that these young people have a career and can pursue work for a better life." Paulino Ruiz writes: "I studied agronomy in the state university here and then I went to Mexico on a grant from the government there....Having had a grant myself, I know how much of a difference it can make... Education is extremely important. Everything, the quality of life, has to do with education. With education, this country can begin to improve. With education we can serve our brothers and sisters." A donation of $60 pays for a one-month student stipend; $850 supports a one-year sponsorship, including monthly stipends of $60 for ten months and staff support for counseling and tutoring. Please click here to donate. If you'd like to sponsor a student, you can download a brochure, and the guidelines and application, or contact us at office (at) bqef (dot) org and we will gladly mail you a set.